This hand-blown, hanging glass "heart" has two openings for double the blooms. Sculptural vase meets exquisitely-colored suncatcher in this striking, hanging glass vessel. Handblown by Terry Weaver, the unique, heart-like glass form features a split, double opening to display fresh flowers or rooting plants, while the organic, contrasting color motif complements the plant forms within. The rims of the two openings meet, forming a space to accept a ribbon (included) or wire for hanging the piece in a window or doorway for all to admire. 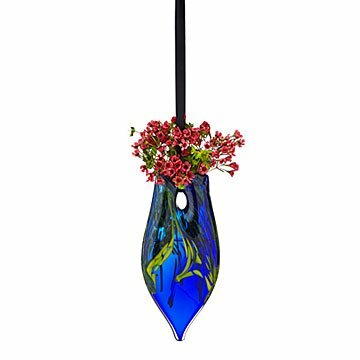 It's a beautiful acquisition for fine glass and flower lovers alike. Handmade in Sand Lake, NY. Wipe clean with a soft non-abrasive cloth. Due to the handmade nature of this item some variance in color and size is to be expected. This made a beautiful gift for my friend. She loves flowers and rooting her favorite, this vase is the perfect way to do this in an attractive manner. Hang it in a sunny window and enjoy the beautiful colors. Looks beautiful hung up with a ribbon with some flowers in the vase. Got the purple one and my mom loves it! Gave as a gift, don't know yet. I was looking for the perfect gift for a 70th birthday party. I wanted something unique; that spoke my heart. My friend and I have spent many spiritual times together. She is an inspiration to all. I found this lovely glass blown bud heart vase. I purchased the purple. In my card I wrote.....Another little piece of my heart.....It was perfect. She loved it. Thank you Uncommon Goods. I love this so much I am thinking of purchasing one for myself. Bought as a hostess gift. She loved it! This is absolutely beautiful piece. She loved it, and is very excited to hang it in her window and see how the sun makes it shine. Really like the subtle heart design. did not see the green sparkle glass on top of purple one on line. Made my own copper hanger for it. more secure than the ribbon. Put ivy cuttings in it just wait for them to take off. This is a very neat vase. however it had too much yellow on it when the vase is to be blue. it was larger than expected which is pretty awesome. The recipient absolutely loves the vase. I was a little nervous about having the gift sent directly since I really didn't know how well it would be packed or really what it would look like. They seem to be really pleased and have already hung it up. My wife loves it! She has it hung in a corner with windows on either side and is rooting trailing pathos. Pretty!